Writing of Arthur Rimbaud, the critic Graham Robb noted that “aesthetic pleasure can often be derived from a mere impression of complex thought.” Robb’s observation has served me as a durable statement of general value and one that proves especially illuminating when considering the work of an artist like the brilliant, highly idiosyncratic Jeffrey Beebe, whose exhibit “Red Soil Boys: The Tyranny of Manifest Fairnesses” runs at BravinLee Programs, in Chelsea, through the end of the week. In addition to fantasy role-playing, Beebe’s work summons echoes of Henry Darger, with his delicate, bloodthirsty Vivian Girls, the Codex Seraphinium, with its hallucinatory catalogue of imaginary items, and Matthew Brady, whose photographs provided the visual armature for a series of elegiac portraits of Uncle deaths. I also see Civil War-era daguerrotypes, Tolkien’s hand-drawn maps for The Hobbit, frontier maps detailing Indian massacres and the like, even a hint of Escher’s scrambled architectural magic. All of these motifs and themes are executed in a panoramic sweep of eye-blinkingly minute ink cross-hatchings and delicate watercolor washes, giving the paintings a gem-like clarity that dazzles mind and eye, and that sticks in the memory like a vision of a dream… or maybe a nightmare. 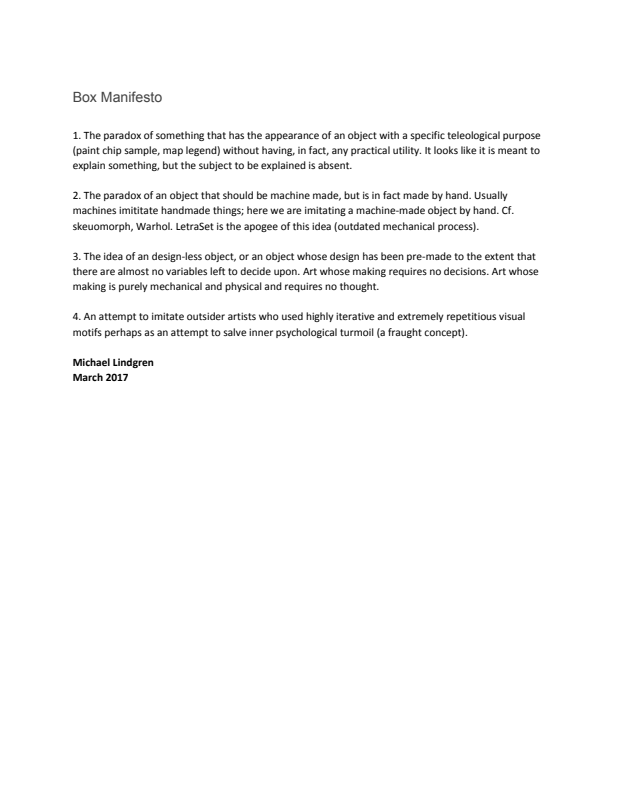 “Box Manifesto.” March 12, 2017.